It took me many years of my monastic journey to grasp this “positive advice” for Lent. For many years the word Lent had a sour aftertaste with rules and regulations I had difficulties accepting. Finally, I was given the grace of understanding. Joy is a keyword for the journey. Joy transforms – joy empowers – joy eases the burden of daily living. 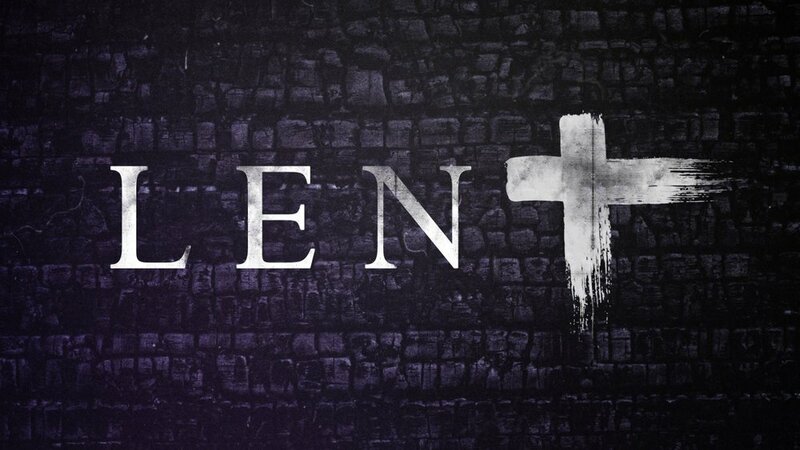 Therefore let me wish you a joyous, blessed and grace-filled Lent! On Easter Sunday let us unite our prayers and voices in a joyous Alleluia as we celebrate the Feast of Feasts, the Resurrection of Jesus! 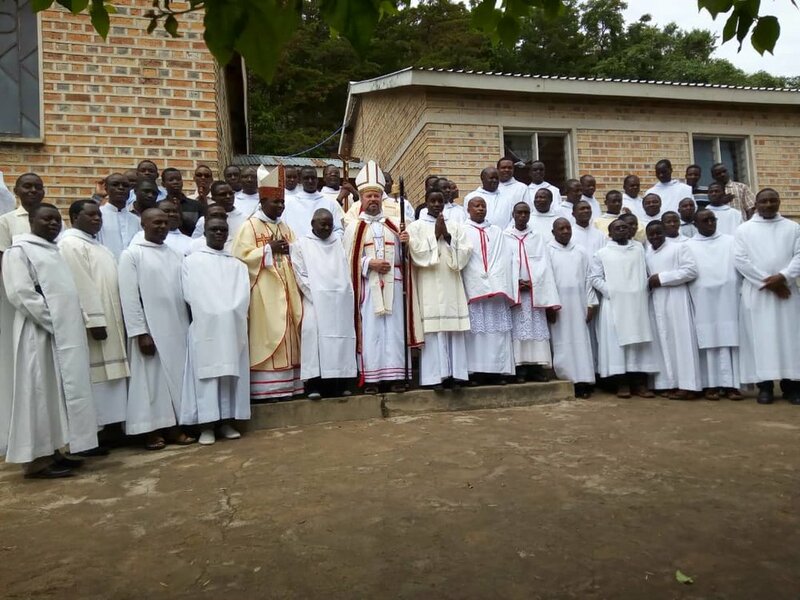 Through the generosity of so many friends and benefactors here in the USA and of our European mission offices, the dream for a church for Holy Spirit Abbey in Mvimwa becomes reality. 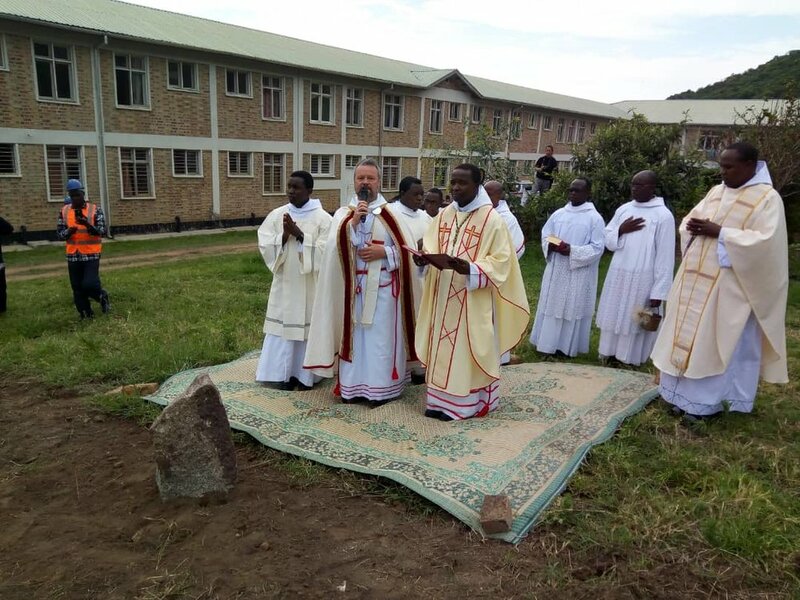 Abbot emeritus Anastasius, assisted by Abbot Pambo of Mvimwa and community members lays the foundation stone for the church and blesses the building site. It is jubilee time! It's a time to rejoice in God's gracious call and fidelity. It is a day to gather with you, Brother Tobias, to celebrate two very special occasions in your life -70 years of life and 50 years as a professed monk of the Missionary Benedictine Congregation. We are so blessed to celebrate with you. What we celebrate first and foremost on a jubilee of monastic profession is indeed God's faithful love. In 1 Thessalonians (5:16-24) we read, "The one who calls you is faithful, and he will do this." God will and does bring us to jubilee days, but not without a generous measure of good zeal on our part. Getting to know you, Tobias, I came to know that you are full of it-good zeal, that is! Thank God! And, thank you, Tobias, for your initial response to this call and for your daily renewal of the covenant you entered 50 years ago. I try to imagine Klaus (as he was known then) as a youngster in his hometown of Karlsruhe in Germany-not for from the Missionary Benedictine Abbey of Muensterschwarzach. One could imagine him with his six siblings engaged in a variety of games and pranks as well as hiking off to serve early morning Mass. I understand that you, Tobias, were not so fond of school as a youngster and found yourself attracted to the Abbey trade school where you learned the skills and art of tailoring. I am amazed at all the ways you've served Community and the People of God over the past 50 years: tailor, cook, housekeeper, Director of Development with mountains of correspondence in that fund-raising/friend-raising work, Priory Treasurer, Liturgist, Vocation Director, Spiritual Director. Add to that list service on the Archdiocesan Pastoral Council and Liturgy Commission, and leadership on the Omaha Archdiocesan Association for Consecrated Life. The list goes on; is there anything you can't do? There is always plenty of manual work and ministry to be done in our monasteries, but Saint Benedict is clear about the monastery as a "workshop" for interior work, perhaps the most demanding work of the monk. We are supplied with lots of tools-74 of them in chapter 4 of the Rule alone. Those tools serve us through all the difficulties and reversals life brings. Anyone who has tried living in community, really living the cenobitic life, knows that community life is not easy. Often it is the "little" things that stretch us-the monk or nun singing loud and off-key; the one who forgets to sign out the car or to return the keys; those who are always "too busy" to volunteer their help in a crunch; the one who always insists that there is a better way to do this; or the one who can't see beyond "this is the way we've always done it!" We really do love these people. It's just that some days, it is a difficult to like them. Such a variety of attitudes and behaviors to deal with! And, through it all we forge strong bonds of affection. Those "little stretches," it turns out , are the stuff of conversion and the means for growing in all those fundamental qualities Saint Benedict tries to foster in his followers­ mutual obedience , humility , a listening heart , respect shown by anticipating one anothers needs, and bearing with one anothers shortcomings whether of body or character. The covenant we enter at profession is a relational covenant requiring inner work. In this school of life-long formation we commit to conversatio morum. We make a solemn promise to seal our baptismal commitment to being transformed in Christ. The challenge is always a change of heart, ever-deepening conversions of heart, met anoia. In his remarkable book, Blessed Simplicity, Raimundo Pannikar writes, "All monastic traditions stress [compunctio cordis, conversio morum, and metanoia] compunction of heart , conversion of lif e, a change of heart ." Monastic spirituality is all about transformation. The monastic agenda of transformation in Christ resonates with a deep and natural psychological orientation. " There is in us," write John Sanford, "an urge toward self ­ realization...[It is] a purging process....[in which] one...finds oneself plunged into the inner fire to be purged, purified and made fit for the kingdom...The emergence of the whole person is...the crucifixion of the individual ego...." It is the paschal mystery at work in our lives. In John's Gospel account (12: 24) this mystery of death and resurrection reads like this: "Very truly, I tell you, unless a grain of wheat falls into the earth and dies, it remains just a single grain; but if it dies, it bears much fruit." This is hard work, decade after decade-for 50 years and all the years still ahead! I am reluctant to speak for you, Tobias, or for anyone else. I just know that for me, there are lots of rough edges yet to be honed in this rock-tumbler we call community life. We bring ourselves-with warts and foibles-to the "table" of life. God does the transforming. It is Eucharist in the daily. God's purpose will not be thwarted. God promised. God is faithful. And, God will do this! All we need bring is our trust, our desire, our good zeal, our "yes" to the ordinary efforts of each day. I've noticed, Tobias, that it is not out of the ordinary for you to cross the Atlantic Ocean often because of Congregational responsibilities. In fact, I think you would hold your own in some frequent-flier-of-the-year competition. Surely, the bi-annual meetings at your Abbey in Germany are made joyful by the opportunity to visit family and the monks there. You have described yourself as an optimist. You do seem to have a penchant for putting a hopeful spin on every circumstance. When faced with a challenge, Tobias' practice and advice is: "Take it to prayer, and let God touch your heart - and don't hesitate to say 'yes."' That is good zeal. In his wisdom, St. Benedict knew that his progeny would sometimes hesitate in the face of what we perceive to be "impossible tasks." Tobias recalls being tested only once to that extent, when in 1975, his dream of being a missionary to Africa was thwarted by an assignment to fill the need for a cook and housekeeper in the pastures of Nebraska, USA! Nevertheless, fortified by his father's recollections of kind treatment as a prisoner of war in the Carolinas and Georgia, and in the spirit of good zeal, Tobias embraced this new mission wholeheartedly-even becoming a US citizen in 1982, and he reports, "I would do it all over again; I am very grateful." And, Tobias, so are we! A brush with death goes a long way in putting things in clearer perspective. As we know, Tobias, you encountered that frightening experience this past year, and came through those perilous days exclaiming, "I want to live!" Today, we are here to celebrate life with you-70 years of it, 50 of those years as a monk. And so we rejoice with you, Tobias, celebrating God's gracious invitation and the good zeal that is your gift and guide through all that has been and through all that will yet be. A jubilee is a time to rejoice and renew our commitment to heed Benedict's wise advice for followers in every age, "Let them prefer nothing whatever to Christ, and may He bring us all together to everlasting life." Fr. Christian Temu, O.S.B. 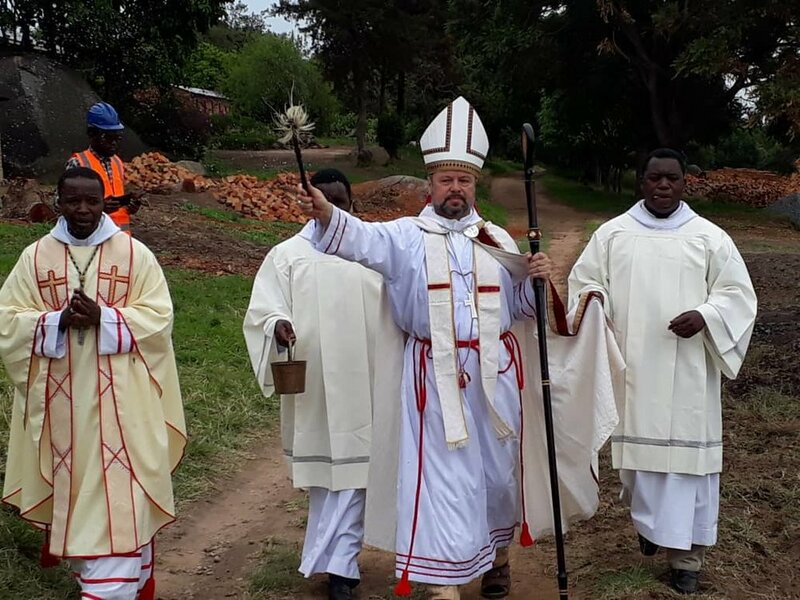 from Ndanda reports: “Construction of the mission station in Mozambique started at the beginning of Lent 2018. Shown in this picture are two monks from Hanga Abbey responsible for the project working hand in hand with local contractor and workers. 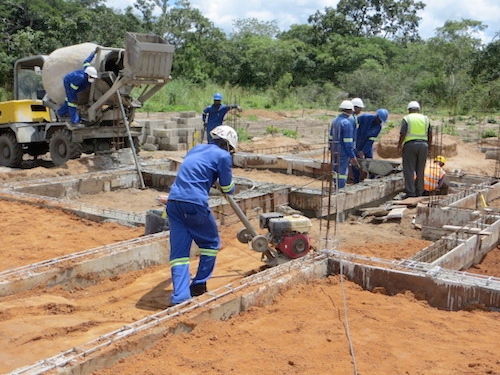 The foundations for the permanent housing for the community are laid; the walls (not shown) are rising slowly. The experts estimate that by Christmas of this year the building will be ready for occupation. The scripture passage comes to mind: “If the Lord does not build the house, they labor in vain who build it.” The monks of Ndanda could only start the project knowing that there is a support system standing behind their effort, one of them the prayers and financial sacrifices of the friends of the Benedictine Mission House. The long winter months are giving way to spring and summer. It is my hope and prayer that the coming months will bring many graces and blessings as we journey through life with Jesus who has conquered death and has risen from the grave to new life with the Father. It was on July 17, 1983 when Br. Vianney left his beloved Germany to embark on a new adventure with Schuyler, NE, as the destination. With the centralization of the mission offices connected with the Abbey of Muensterschwarzach and computerization of data entry and correspondence, the position Br. 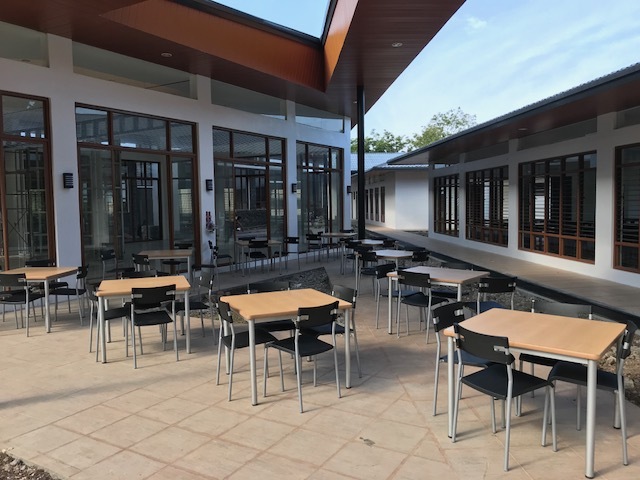 Vianney held at the study house St. Benedict in Wuerzburg was eliminated and the leadership had to find a new assignment for him where he could put his talents to work. In conversations he often remarked about the years as “city monk” in Wuerzburg and the work with altar servers and visits with donors in the area. Throughout our history of 82 years, monks from the Mission House ventured out all over the country, visiting donors and finding new ones. Br. Vianney was introduced to the art of visiting donors by Br. Norbert and Br. Henry-Libory. These personal contacts have been the foundation of our fund-raising efforts. For a short time Vianney accompanied Henry-Libory. It was reported that once Henry had a foot in an open door he did not budge until he had delivered his speech, and asking if another donation could be made. Vianney developed his own style. He struck many lasting friendships. It is said that within five minutes he could find out personal information and details about families and issues. Vianney’s primary mission during the years as traveling brother was to thank people for their support and to inform of projects of missionaries. A traveling brother never knew where he will put down his head for rest at night. Over the years a network of friends providing hospitality made planning a trip easier. Following the death of Br. Innocent in 1990, Br. Vianney was asked to take over the kitchen. Since I was the assistant to Br. Alphonse in the office, the leadership thought it is better to keep me in the office then to give me the original assignment which brought me to Schuyler, to be the cook for the community. Bro. Vianney, who had no background in cooking at all, accepted the challenge. He enrolled at Metro Community College for a course in Culinary Science. To learn more about baking bread he spent a week or so at Blue Cloud Abbey in South Dakota and also learned from Kurt Guenther, our former chef. In the early 1980ties Br. Innocent had taken over the kitchen at the time Kurt transitioned to be cook for the Jesuit community at Creighton Prep in Omaha. After Vianney’s retirement, Kurt returned to Schuyler in 2010. Thanks, Kurt, for your time and patience in teaching Vianney. He treasured your friendship and the many hours of visiting. During the early months in the kitchen Vianney also learned from the Sisters of Immaculata Monastery in Norfolk, especially from Sr. Elizabeth, Sr. Jania and Sr. Gilberta. Many Saturdays, Sr. Jania came over from Columbus and cooked for the monks and teaching Vianney. He did not always listen to their recommendations, especially how to use the oven to keep food warm, a recommendation he had a hard time with to incorporate. Sr. Gilberta instructed him not to take murmuring too serious but to be firm in telling the community that the food on the table is all they get! No exceptions! Canning and freezing produce for later use, Vianney learned from our housekeepers Mary Ann and Becky even though many years he conveniently was on vacation during the canning season. Each Christmas, Vianney baked Christstollen – a special holiday bread – but using Sr. Gilberta’s recipe dating back to the years after the war when butter was not so plentiful, turned out rather dry, yet it was delicious especially when buttered. In later years he sold the “stolen bread” as people called it during the Christmas on the Hill craft show. Vianney was known for his variety of breads, especially a sourdough bread, and coffee cakes and torts. On his shopping tours to Omaha, including Sam’s Club, he found out that cooking from scratch is not the only option, but that the frozen food department has also delicious creations ready to be placed into the oven or microwave. Vianney had an eye for beauty. He loved a festive table setting. When the monk helping did not do it to his expectation he was told. For Christmas, Easter, Thanksgiving and other community celebrations he prepared wonderful dishes, arranging serving plates artistically. Throughout his time as cook, Vianney was granted each year a few weeks for visiting donors. He also dedicated time every afternoon to keep up his extensive correspondence with donors, family and friends from near and far. During his absence Mark and Patty from St. Benedict Center’s kitchen made sure that the monks will not starve. 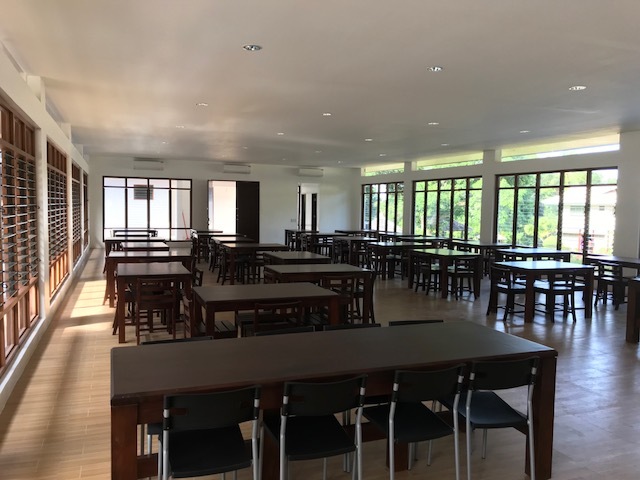 Meals were picked up at the center and then served in the monastic dining room. Vianney always had a keen interest in German politics and the life of the Church in his homeland. I have my doubts if he ever considered becoming a citizen of the United States. One thing is for sure, we are all citizens of the kingdom of God and the heavenly Jerusalem. There are many other stories that come to mind. However, I better shut up and invite you to share memories of Br. Vianney. Following Mass, we will continue sharing over a simple supper in our dining room to which the community invites you – crowded as it may be, but under Vianney’s time we had at least once each year a gathering of over 100 people for a Christmas party and dinner. Once St. Benedict Center opened these events were moved to the retreat house. Vianney, the Lord may grant you now eternal reward for your faithful service. Rest from your labors, unless the Lord has assigned you to the heavenly bakery or kitchen. Loving greetings from the Monks of St. Benedict’s Priory in Digos, Philippines! Since the foundation of our monastery in the early 80's, it was the dream of the late Bishop Generoso Camina, P.M.E. ; D.D. to have a Spiritual Well-Spring in his diocese. 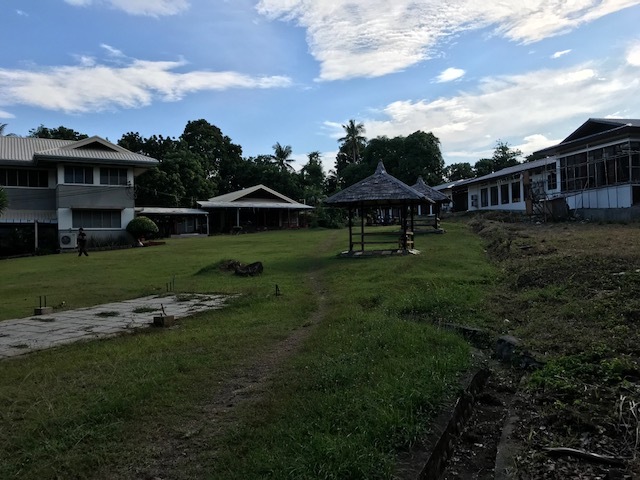 Shortly after its foundation of the Benedictine Monks, in 1986, the Retreat House was built to respond to that dream! 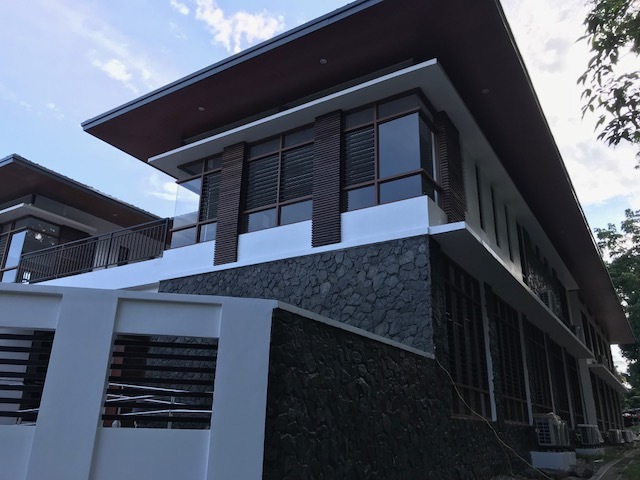 Since then, our Retreat House has made a stamp in helping the young Filipinos build and strengthen their faith and prepare them for their future lives after schooling. 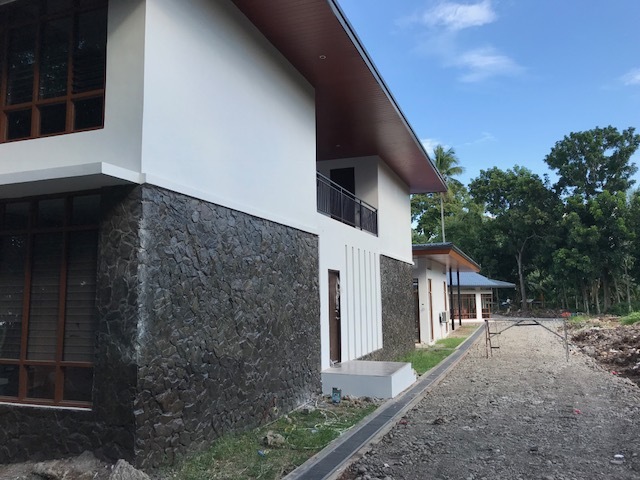 Since we are serving 3 to 4 Dioceses, a new wing of the present retreat house has to be added in order to respond to the coming groups of retreats in all walks of life. We are so grateful that Bro. Tobias and the whole Community of Monks in Schuyler has been supporting us in our different programs/projects. This was made possible because of YOUR (Dear Friends) constant support and trust YOU have for us monks. THANK YOU SO MUCH for all that has been, our DEAR FRIENDS! Rest assured of our continued prayers for all of you and your loved ones. NOTE from Brother Tobias: This is still an on-going project. Your prayers and support are still needed and appreciated. Click to read more about this Current Appeal. A long-awaited project has been completed at the Benedictine Mission House. Nick Brichacek of Brichacek Construction installed a new hydraulic lift. This lift will provide a much easier and safe method for the Mission House employees to load and unload mail carts and pallets from the various trucks and semis. Today was its “maiden voyage” as it was used to unload empty mail carts that will be soon be filled for our next appeal.